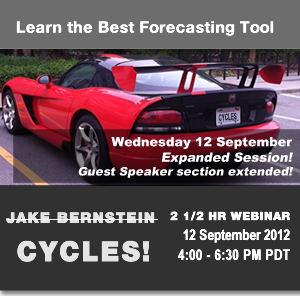 2 1/2 Hr Webinar - Presented by Jake Bernstein 12 September 2012 Cycles - How to Use Them, How to Project Them, How to Time Them... How NOT to Use Them... What a cycle is and what it is not Why do cycles exist and are they for real? Cycles in ALL MAJOR markets The major economic cycles The great economists and their cycles work The “business cycle” The “real estate cycle” The Kondratieff Cycle How to find cycles the fast and easy way Long term, intermediate and short term cycles Cycles in spreads and ratios The HUGE combination CYCLES + Commitment of Traders What the cycles are saying now Timing and Cycles Why the cycles arenow more important than ever! When to USE and BELIEVE cycles and when not to Combining cycles for best results Cycles as a SETUP tool in the Setup-Trigger and Follow-through model Intraday cycles: fact or fantasy? My best cycles for traders and investors Seasonal cycles How the cycles allow me to consistently and correctly forecast big moves Do the economic cycles now forecast deflation or inflation? Advanced cycle tools (that you really don’t need) GUEST SPEAKER: 15 minute presentation by prominent cycles researcher And much more!